2018 was quite a year for Lake Homes Realty! In the last 12 months, our corporate headquarters relocated to a larger, multi-tenant business complex; ranked on the Inc.5000 list of fastest growing, privately owned companies in America for a second consecutive year; and opened operations in six more states. Across the nation, the year has been good to many lake real estate markets as well, including these five markets, which ranked among the largest lake real estate markets in the country in 2018. From the beginning of 2018, No. 1 Lake Michigan’s overall market value (or the combined listing value of all the lake’s properties for sale) increased by nearly 35 percent, according to LakeHomes.com’s Fall Lake Market Report. Individually, the lake’s home and land markets saw overall value increases of 45 percent and 9 percent, respectively. This rather wide margin between the two markets can be attributed to uneven increases in listings and average home price. While land listings on Lake Michigan increased from 822 in January to 900 this fall, residential listings more than doubled, up from 673 to 1021. This spike in homes for sale increased Lake Michigan’s total market by approximately $293 million over the year. This market also saw its average home price increase by about 10 percent to roughly $1 million. As of fall 2018, the Lake Michigan real estate market is valued at more than $1.2 billion. Its home market currently boasts listings totaling nearly $957 million, while Lake Michigan land listings total about $267 million. The second-largest lake real estate market featured in the Fall Report, Lake Norman has an overall market of roughly $795 million, up 24 percent since January 2018. Lake Norman’s home market increased by more than 28 percent this year to $654 million. This is likely due to an increase of 181 residential net listings since January; however this increase also resulted in a drop in average home price, which is down from $876,000 to $849,000. The lake’s land market also grew by about 9 percent to $141 million, despite a slight drop (4 percent) in listings. In total, Lake Norman currently has 1,225 listings along its 520 miles of shoreline. Lake Lanier, ranked No. 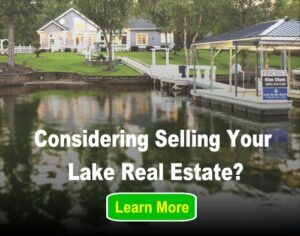 3 among LakeHomes.com’s largest lake markets, reports a total inventory of 1,397 listings valued at roughly $650 million. This market saw increases across the board in both number of listings and market value. Its average home price, however, remained virtually unchanged compared to winter 2018 data. Most significantly, Lake Lanier’s home market rose more than 46 percent in listing value, up from $329 million in January to $482 million in the fall. Homes for sale increased as well, by nearly the same amount, 48 percent, from 591 to 872 listings. Land listings increased from 459 to 498 this year, driving the market’s value up almost 10 percent to $139 million. The Fall Market Report puts Lake Lanier’s average home price at $553,000. At $616 million in lake real estate, Lake Travis is the No. 1 largest lake in the Lone Star State, and the fourth-largest featured in the Lake Market Report. Since the beginning of 2018, this market has increased by more than 22 percent in overall market value and almost 30 percent in total inventory. Much of this influx of net inventory is homes for sale, which almost doubled this year from 242 listings to 354. Because the home market increased by only about 23 percent, Report data indicates the average home price on Lake Travis dropped 12 percent. Currently, this average home price is $1.4 million, the third-highest in the state. The Lake Travis land market value increased by 18 percent over the same period, with listings increasing by about 14 percent. Land listings now total $120 million. Rounding out our list of the Top 5 biggest lake real estate markets of 2018 is Georgia’s Lake Oconee. Its 1,207 total listings combine for a total market of $496 million, up 14 percent from $434 million at the beginning of the year. The lake’s land market increased slightly to $147 million from $141 million in January. Land listings decreased by only one property compared to winter data. Approximately 18 percent more residential properties are on the market at the end of 2018 than were for sale at the beginning of the year. Currently these residential listings combine for a total lake home market value of $328 million. Lake Lanier’s average home price only increased by about 2 percent. Each quarter, LakeHomes.com publishes an in-depth Lake Market Report, that analyzes real estate data pulled from the approximately 100 MLSs of which they are members, to feature the Top 10 lake real estate markets across 16 states in the Central and Eastern U.S. The 2018 Fall Lake Market Report reflects values of current listings across each lake’s home, land and commercial markets as of Sept. 1, 2018, at which time Report data was pulled. These figures – market value, average home price, etc. – represent only those properties currently on the market. For more information about your local market please download your free copy of the Lake Market Report here!